A typical arrangement of recycling and waste containers on University campuses, from left to right: plastic, glass, and metal containers; non-recyclable trash; mixed paper. 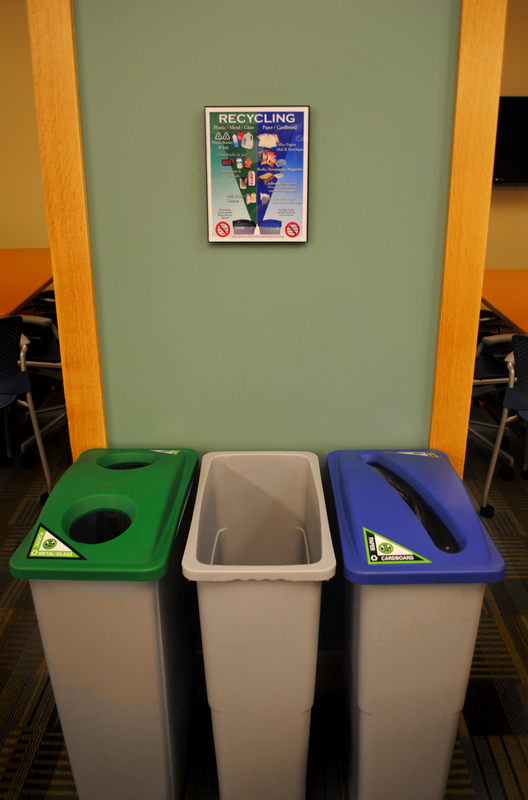 “Trios” of trash and recycling bins can be found standing together all over the River Campus and in parts of the Medical Center. Thanks to the campus recycling coordinator, Amy Kadrie, these waste stations have been placed in more frequent and convenient locations in recent years to increase the ease of recycling. Framed guides above the bins help students, staff, and visitors know how to sort their waste; and campus events such as RecycleMania help spread awareness about recycling and waste reduction. Even the outdoor recycling program has expanded with receptacles placed around the River and Medical Center campuses. However, this is only the beginning of the extensive recycling program at the University. Behind the scenes, numerous other materials are collected and recycled besides the typical containers and paper products. So, what’s the goal of all these initiatives? It’s to increase the rate of recycling and reduce the amount of garbage produced by the entire University community in order to decrease our impact on the environment. And thanks to the efforts of a lot of different people, we know it is working. Throughout the year, recycling data is compiled from various sources within the University. The weight of all materials that are either sent to the landfill, recycled, or reused from each University facility, including the River Campus, the Medical Center, the Memorial Art Gallery, the Eastman School of Music, and off-site locations, are collected per quarter. This data doesn’t end with the trash and recycling collected by the waste stations; in fact that’s only a small piece of it. 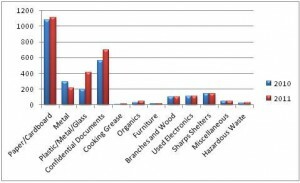 Over 36 different materials are tracked, including electronics, cooking grease, compostable material, mattresses, used carpet, wood pallets, yard waste, clothing, sharps containers, x-ray films, and hazardous waste. Even the weights of batteries and ink cartridges, like the ones dropped off at the IT Center of Rush Rhees Library, and the sneakers put in the Nike Reuse-A-Shoe recycling bins in the gym locker rooms are recorded as well. The above graph reveals the increase in recycled materials relative to the amount of trash produced by the University from 2005 through the end of 2011. There has been a steady increase in the recycling rate as compared to trash. 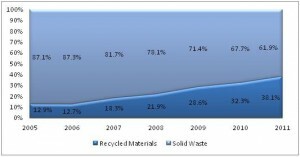 Much of the recycling increase in recent years is actually a result of construction projects. Concrete, metal, cardboard, plastic, and wood make up the majority of the materials that are recycled from construction sites. One of the major projects that affected the recycling rate for 2011 was the new Saunders Research Building, which began construction in 2009 and is now LEED certified! The renovations Danforth Dining also contributed. In fact, 75% of the waste materials from renovating Danforth were diverted back into to the manufacturing process. It is exciting that so much construction waste can be recycled, but even without those projects, the data shows that our overall recycling to waste ratio is still improving. This graph, is the same graph as the previous one but excluding the data from construction projects, and still shows a significant increase since 2005. Ever wondered what materials we recycle the most of? This pie graph represents the percent by weight of each material that the entire university recycled in 2011 (excluding construction projects which made accounted for 47% of the total tonnage recycled). 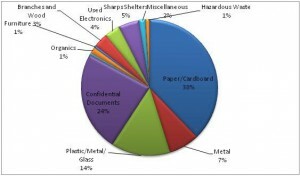 As you can see, paper products (paper, cardboard, and confidential documents) account for over half of the recycled material. Each ton of paper we recycle saves 17 trees, 3 cubic yards of landfill space, 2 barrels of oil, 7,000 gallons of water and 4,100 kilowatt hours of electricity. (EPA, 2008) The plastic, metal, and glass category makes up for the second most recycled material. This is what is collected from the green-topped recycling bins found all over campus where people can dispose of their used containers. Comparing data with the previous year is another way to demonstrate our progress in recycling, as well as identify areas for improvement. This graph shows the weight in tons of many materials during the year of 2010 (blue) and 2011 (red). This all adds up to great environmental benefits. According to our EPA WasteWise 2011 Climate Profile, we reduced over 9,000 metric tons of Co2 emissions, thanks to our recycling efforts. This is equivalent to taking 1,663 vehicles off the road and saving over 1 million gallons of gasoline! As the University continues to strive to increase recycling and reduce solid waste, you can do your part by making sure to recycle whenever possible. You can get your own copy of the poster that is framed above the waste stations on campus at: http://www.rochester.edu/sustainability/recycling/. A lot more is recyclable than you might think! In developed countries, people are showing their interest in recycling as much as possible, but in developing and undeveloped countries people not aware about the benefits of recycling. Rate of waste production in developed countries is reduced in the last decade because of recycling. So that., developed countries should be organized recycling camps and awareness programs in developing countries.